Including pears in your diet in place of higher fat foods may decrease your overall intake of fat and cholesterol. While many factors affect heart disease, diets low in saturated fat and cholesterol may reduce the risk of this disease. Likewise, development of cancer depends on many factors. A diet low in total fat may reduce the risk of some cancers. We need fat in our diets to perform many functions in the body. That said, too much fat—especially too much trans fat or cholesterol—may lead to coronary heart disease, a disease associated with many factors. Foods high in fat are usually high in calories, which may lead to eating too many calories and weight gain, another risk factor for heart disease. 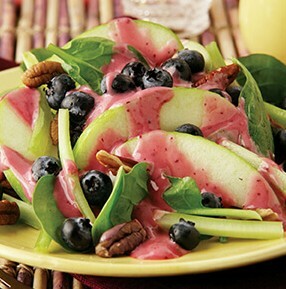 Keep lunch light and simple with this tasty Blueberry and Pear Waldorf Salad.